Have you ever wondered why Dorothy wore ruby slippers in the Wizard of Oz? Why not diamond or sapphire slippers? Not only are these stones sparkly, brilliant and eye-catching – and would wow audiences in the first color movie, but what the writers didn’t know – and is ironic – is in ancient times rubies were believed to protect people from evil spirits. 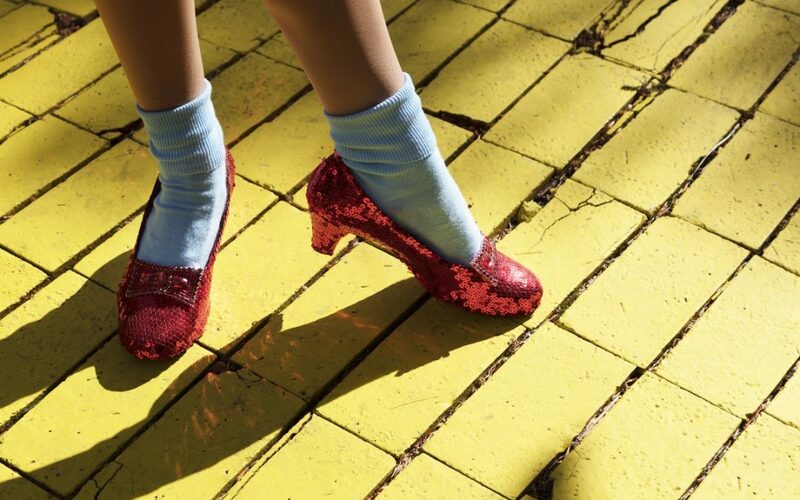 So not only was Dorothy skipping around in the most gorgeous shoes to have ever been made – she was protecting herself from the Wicked Witch of the West! Obviously, Dorothy’s slippers were not made of REAL rubies in the filming of the iconic movie, but on the 50th Anniversary of the 1939 movie, Harry Winston made a pair of slippers with 4600 rubies and 50 carats of diamonds. But to twinkle your toes in those beauties will cost you a sizzlin’ $3 MILLION. Nothing evokes such strong emotions as the Ruby. The color red is symbolic of extreme emotions such as passion, lust, envy, and anger. Even the inward glow of the ruby transfixes the beholder and stirs up intense desires and emotions. In addition, the Ruby has been a symbol of power from the beginning of civilization. So desirable and precious are they, that the early Sanskrit language called rubies, ratnaraj, meaning “King of Precious Stones”. The ruby is the 2nd hardest gemstone, behind only the diamond. Of the 12 birthstones, Garnet, Amethyst, Aquamarine, Diamond, Emerald, Pearl, Ruby, Peridot, Sapphire, Tourmaline, Topaz, and Turquoise, it has the distinction of being the most prized. With a red color and inner fire from natural fluorescence, rubies are believed to hold the power of life. As it is also reminiscent of blood, the people of the Ancient Orient said the stone was “a drop of the heart’s blood of Mother Earth”. They firmly believed life, vitality, and protection were bestowed on the wearer. Similarly, it was known as the stone of kings in nearly all cultures. It’s not surprising the ruby came to represent living life to its fullest and embracing the joy of life; along with wealth, power, strength, and vitality. The color of the ruby is so important that early cultures separated the stone into castes: lower, middle, and upper. Superior rubies became prized for their deep red/blue color and inner fire. As a result, lower quality stones were banned from having any contact with their superior counterparts in order to prevent contamination and protect the intrinsic powers of the finer rubies. In China, the color of ruby worn by an individual revealed their status within society. A ruby’s value is based on flawlessness and beauty, and definitely the color. The most desirable of colors is “pigeon blood”. Famous pigeon blood rubies are the Sunrise Ruby and the Hope Ruby. If you love the beauty of marble then you’ll be delighted to know that marble is the host rock of rubies! The Liberty Bell Ruby was made for the Bicentennial Celebration of the United States but it was stolen in a jewelry heist in 2011 and has never been recovered. Almost all rubies are heat-treated to improve their color and intensity. It has the distinction of being one of the four “precious” gemstones. The others being diamond, emerald, and sapphire. Ruby and Sapphires are made of the same mineral. The only difference is color. In fact, light pink stones are qualified as a “pink sapphire” and only the deep red stones earn the distinction of “ruby”. Inclusions in the gemstone are a tell-tale sign that the ruby is natural and not synthetic. North Carolina is the only place in the United States where this gemstone can be found. Passion is at the forefront of this brilliant stone. Not only was it referred to as a “dearly loved stone” by the French in the late 1800s, but it has long been appropriate for engagement rings. Of all the gemstones, the ruby stands out as the one that most represents love and passion. The ruby is so full of meaning, including beauty and wisdom, that those looking for an especially meaningful ring or other custom jewelry item, may find that the ruby conveys a depth of emotion and character attributes unparalleled with any other gemstone. Intense love, passion, strength of character, wisdom, and a life full of joy are only some of the qualities communicated through a ruby. We would love to help you design your own custom ruby ring. If you are in the Colorado Springs area, stop by our downtown shop and we’ll find the perfect solution for your situation. Or call us at 719-232-8122 to make an appointment with Jack or one of our other talented jewelers.